On first glance it probably looks like I bought a skein of Christmas yarn in May. Not so. This yarn is cool, as in a summer-cool. It's Watermelon sock yarn that I found on Etsy. Okay, so you agree that the colors are right, but that's not enough to make it look like a watermelon. Where are the seeds? Well, they are there. Check out this picture, click here. 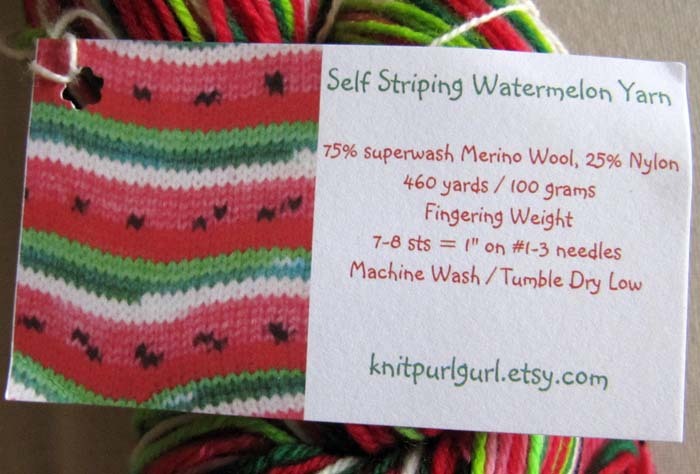 Apparently any basic sock pattern will cause the yarn to stripe like a watermelon. As soon as I free up a set of double pointed needles, I'm going to cast on. I'll let you know how it turns out. Subtle yarn? I don't think so. I like that! I swear--the first thing I thought of when I saw the photo, before I even read the text--was WATERMELON! I ordered some of that from the same etsy seller recently. I can't wait until it shows up. Every time she was offering it, I didn't have the extra cash but this time, the stars were aligned! These socks are great. I made a pair and the yarn is soft and wonderful to work with. You will love them. 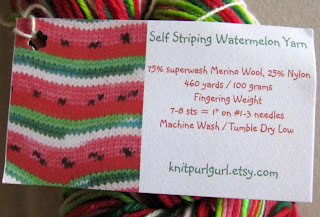 I love this yarn - it is so fun to watch the watermelon stripes form. When I got it I thought the colors were too garish to get the results I had seen in the photo - but together they work out perfectly.